Each episode will be between 10,000 and 20,000 words with new installments being published every 2 to 3 weeks. Roman Socoli inadvertently releases a terrible evil when he has his Romanian ancestors entombed on his estate in Houston, Texas. “Roman, are you ever afraid?” Roman shook his head. “Should I be?” “Maybe we all should be,” Alisha responded before closing the door behind her as she left. Staring at her intently, his expression hungry and full of desire, she felt his mind touch hers. I shall be your Master and you shall be my Bride..
Jump back 10 years to 2001. Roman, Alisha, and Vanora Sicoli are siblings living in their parents’ estate, whom died years ago. We only see a small amount of interaction between the three but we know that they have a very close and a very cute relationship. I connected with them immediately and I’m really pulling for them. Roman, the eldest by 10 years, has a deep respect for his Romanian heritage, instilled by his parents, and travels back to Romania to bring his ancestors bodies home as the Romanian government has confiscated his families old estate. I’m on Alisha’s side with this - it’s creepy and I don’t like it. Alisha has what she calls a Second Sight and is very uneasy about their ancestors being brought to their home, especially since one of the graves was covered in chains and Roman had them removed. Bad move. (This isn’t a spoiler, if something bad didn’t happen, well, there’d be no novel/series, would there?) Removing these chains lets out something evil that beings to stalk the siblings. I probably should not have read this at night. And I don’t mean all of season one, I’m talking just episode one. Frater creates this creepy feeling, that it takes some authors entire novels to accomplish, in just 50 pages. Less than that actually because I spent 2/3 of Death Comes Home on edge. 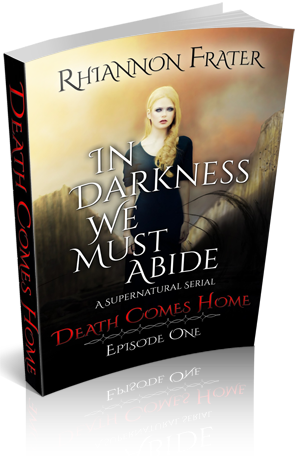 If you are a fan of vampires, gothic novels, and horror stories, this is definitely a series you need to start and you need to start it now.